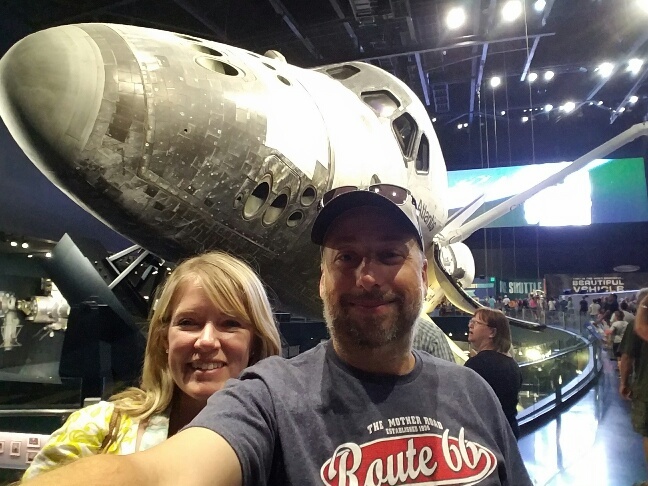 NASA and Kennedy Space Center – Live MoHo! After two grueling days of mirth-making at Universal, and still on a bit of a Kong hangover, we were ready for something more serious. Something spacey. Something less than 20,000 steps. Something not sopping wet. 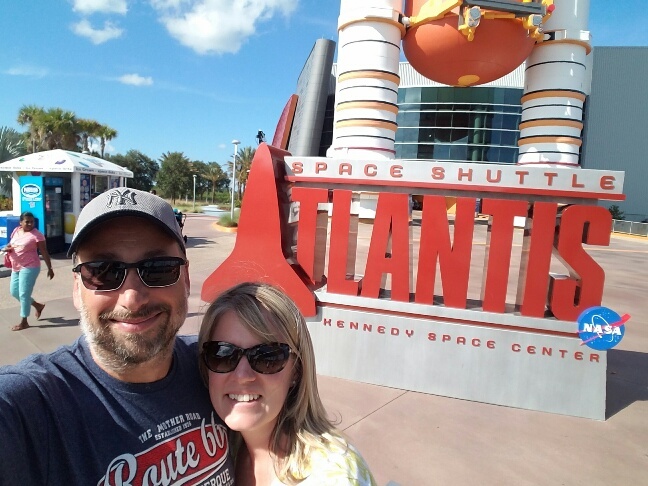 What better place than the Kennedy Space Center, just an hour or so from Orlando? Well, an hour in normal place traffic. Tack on an extra 45 minutes to allow for the Orlando version of normal traffic! 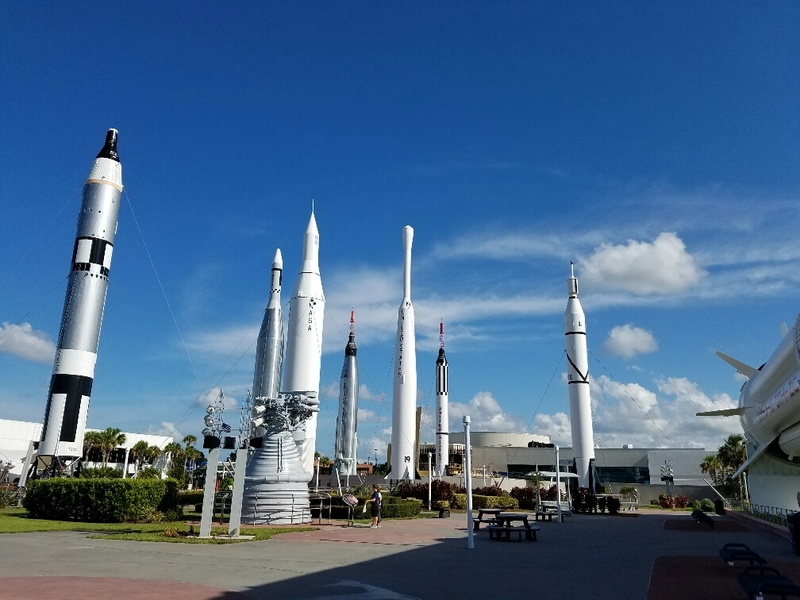 Kennedy Space Center is the site for the iconic rocket launches of the Apollo moon landings and the Space Shuttle. 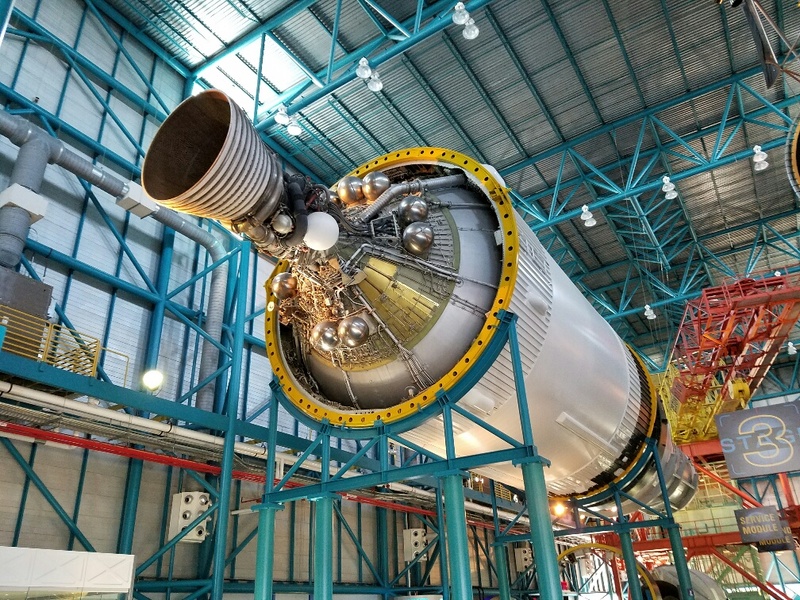 KSC has one of only 3 Saturn V rockets left, having an entire building dedicated to the rocket. It also has the Space Shuttle Atlantis. Right inside the main entrance is the Rocket Garden. Wonder where they came up with that name? Several decades worth of rockets were on display. The original Redstone rockets from the Mercury program rockets were here. They looked smaller in person than I expected. It was a reminder that the first astronauts rode into low earth orbit on repurposed ICBMs that were originally designed not for lofting people, but for carrying nuclear warheads. 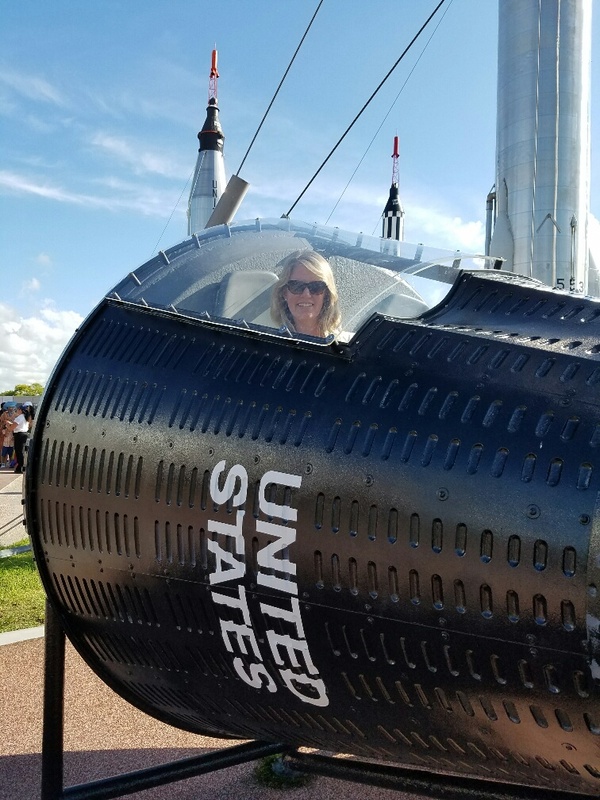 They even had a Gemini capsule mockup that we could sit in. That thing is TINY. How two people could spend more than a few hours, let alone days, in that thing is beyond me. And the Gemini capsule was twice as big inside as the Mercury capsule! We hopped on the tour bus; the is the only way to see other parts of KSC beyond the main visitor center. 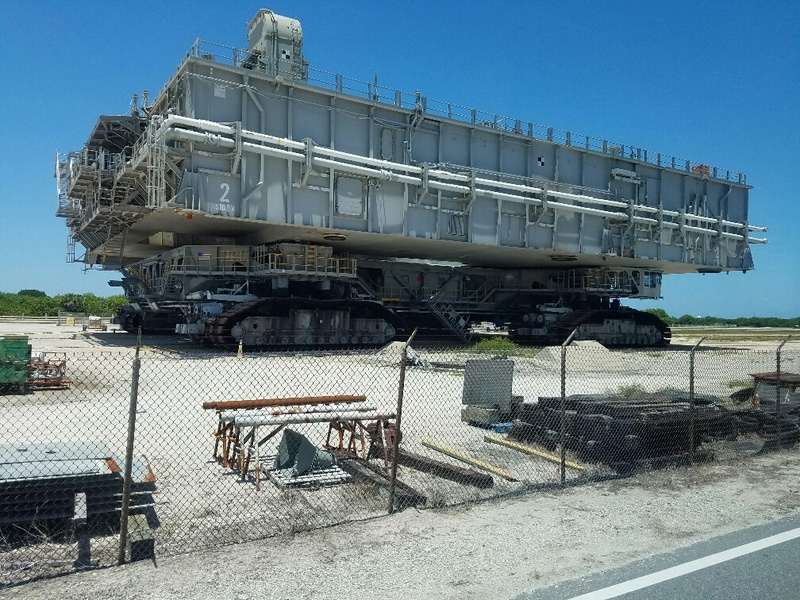 On the drive, we passed the massive rocket transporter which I still think looks like a Star Wars Sandcrawler. I will have to look up whether that was an inspiration for George Lucas when he made Star Wars. The rockets are loaded on this thing for transport to the launch pads. 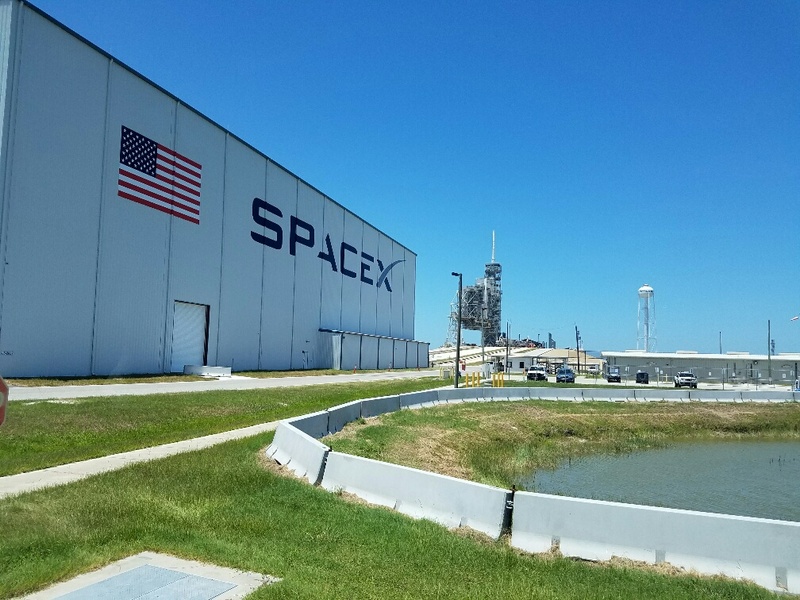 We saw two large buildings that have been taken over by Space X. Elon Musk is serious about rocketry and Space X is a frequent sight on the KSC launch pads. I was glad to see them working with NASA and NASA being open to that, since Space X could be viewed as a competitor of sorts. I can’t imagine the torturous life those deflectors have. I guess its probably a lot like the toilets at a truck stop. The bus eventually dropped us at the Apollo building. We waited to go inside and once there we saw the control room for the Apollo missions. Not a mockup. The ACTUAL control room for the Apollo missions. What a cool piece of history. As part of the tour, NASA simulates an Apollo launch and we watched the various stations and monitors light up as the countdown commenced. 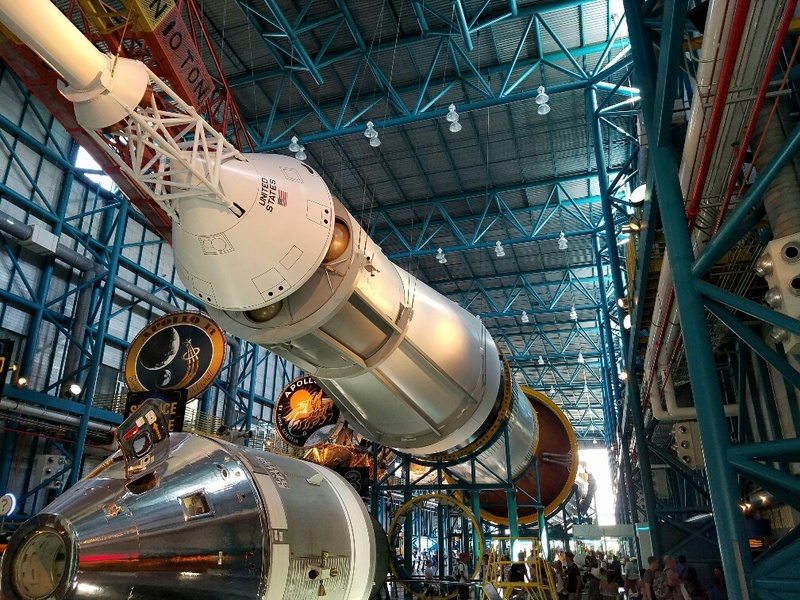 Just past the control room, the tour opens up into a massive hangar where one of only 3 surviving Saturn V rockets is on full display. Its hard to appreciate just how huge that rocket is, or how complex, until it is seen up close like this! 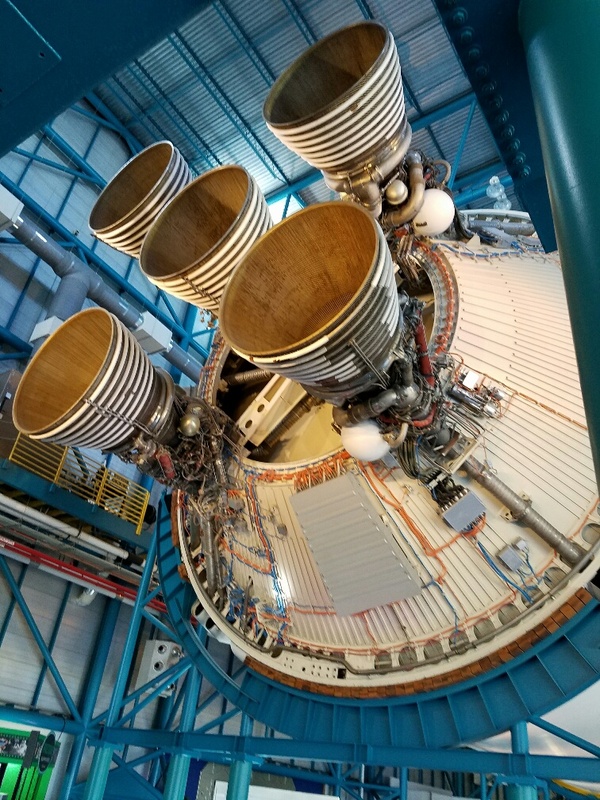 Each stage of the rocket is impressive, with the first and second stages featuring massive rocket engines. The F1 engine, which we first saw at Alamogordo New Mexico, generates over a million pounds of thrust. Interestingly, they basically burn kerosene. Seems kind of like a low-tech fuel, but hey, I guess it works! The upper stage was used to breakout of Earth orbit and launch the Command Module and LEM into a translunar orbit. The first, and so far the last, rocket to do so with a manned crew. 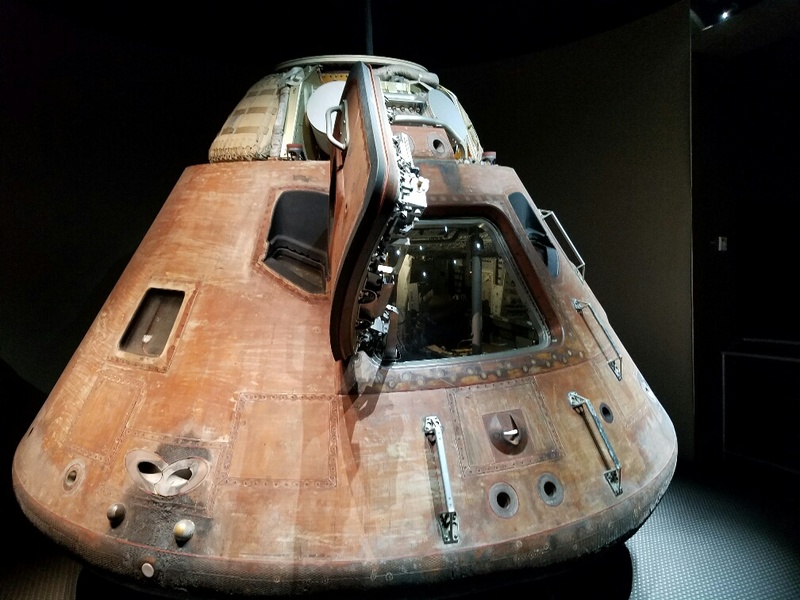 The re-entry module of Apollo 14 is on display inside a large vault with actual moon rocks. It still wears the scars of its fiery re-entry. I have seen moon rocks before. There were some on display in ABQ, at the Naval Musuum in Pensacola, and at various other museums. Heck, there were moon rocks in a travelling display that came to my elementary school in the 1970s. Always they were embedded inside a polycarbonate block to protect/preserve them. But NASA actually has one mounted here at KSC without any cover at all. We touched it directly! The rock is just a small black basalt rock that has been sliced from a larger sample. It isn’t really much to look at. 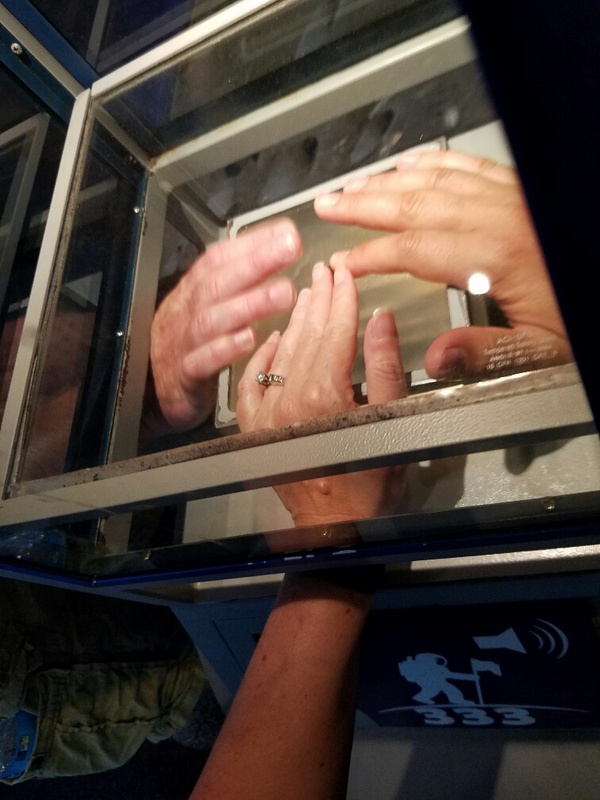 Yet somehow, it felt very awe-inspiring to actually touch a piece of the moon! I don’t know why touching a thing makes it real. But it does. People have to touch the world. Mostly, it gets us into trouble at museums or other natural wonders. On the NYC subways, it just makes us sick. But touch is the difference between watching the world on television vs. actually experiencing it. Anyway, very cool to touch the moon. I don’t know how many people can say they touched the moon, but now we can say it! 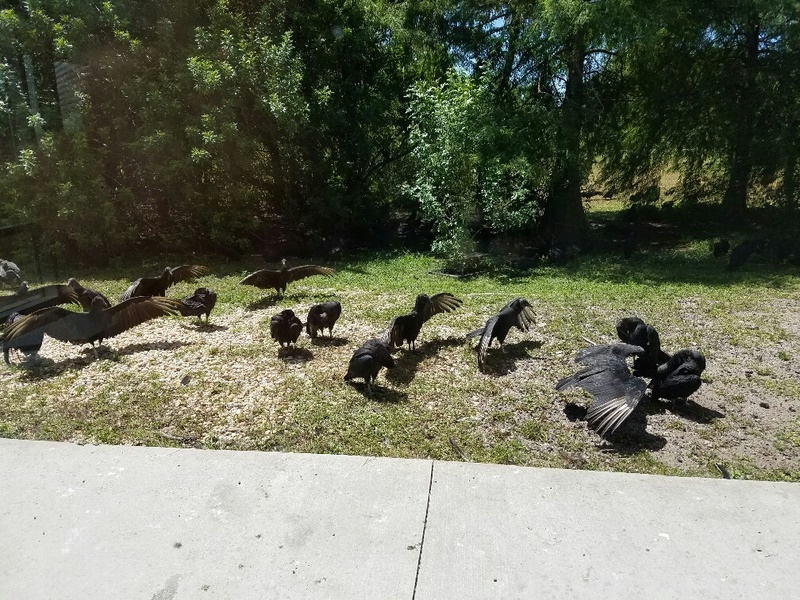 We looked out a window and saw hundreds of those crazy birds (Black Vulture) that we first saw at Tallahassee museum. Like that bird, they had their wings spread in the sun. I have no idea why. Nor do I know why there were probably a hundred of them just hanging around. Kind of cool, kind of weird. Speaking of weird, here is a weird random fact about those birds. They crap on their own legs which evidently helps them stay cool in the Florida heat. It has been really hot here, I won’t lie. But I have never been tempted to try THAT to stay cool. We wrapped up at the Apollo site and got back in line for the bus. NASA really has this dialed in. There were a LOT of people at the KSC, but the busses run very regularly and nobody had to wait for very long. 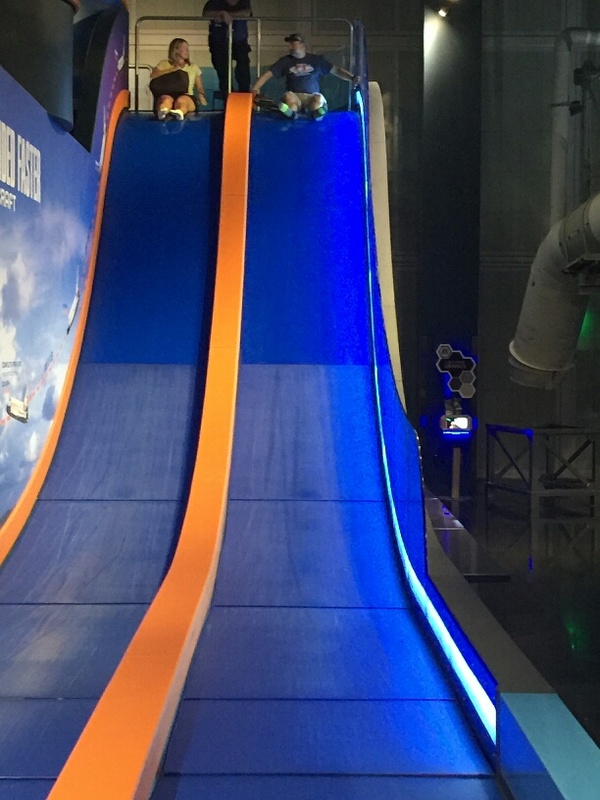 The other big attraction is the new Atlantis Space Shuttle center. 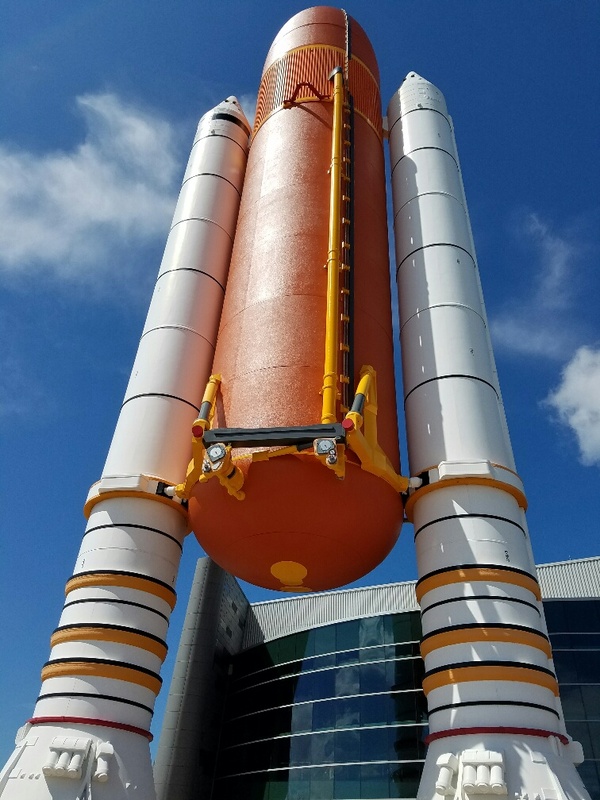 The center is impossible to miss with a full-size replica of the Shuttle external fuel tank and solid rocket boosters standing proudly outside. After watching a movie showing the origins of the Space Shuttle project, we walked to a launch simulator. The overall effect is pretty cool. Also, it is reminiscent of the Apollo entrance. Step 1, watch short movie. Step 2, see a simulated launch. Step 3 see an actual spacecraft. The difference is that at Apollo, we sat in the control room to watch the simulated launch while at Atlantis we were in a mocked up viewing area about a mile from the Launchpad. When the launch ends, the screen itself vanishes and the actual Space Shuttle Atlantis becomes visible through a mesh wall that raises up. The effect is very dramatic and very impressive! It is awe-inspiring to see the shuttle and NASA has it displayed extremely well. 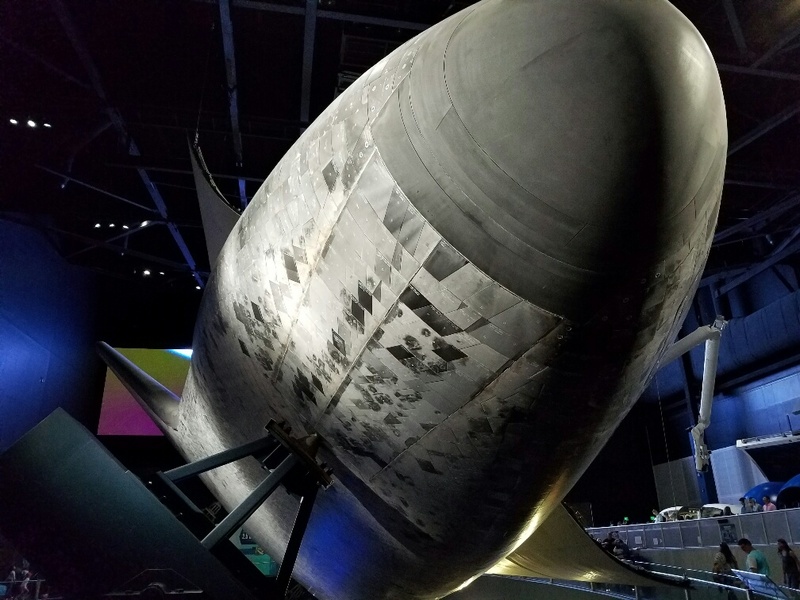 The shuttle bears the scars of its 33 trips into space, from the scorch marks on the heat shield tiles to the scuffs and scratches on its skin to the pitting on its wings. Like the old veteran of space that she is, Atlantis wears her age proudly! Construction on Atlantis began in 1980, and she first launched into space in 1985. Her last flight was in 2011, after 26 years of service! Its hard to imagine driving a car made in 1980 in the year 2011, let alone driving it into space. The shuttles were pretty tough! The underside of Atlantis is covered with thousands of individual ceramic tiles designed to help the shuttle survive the tremendous heat of atmospheric re-entry. The tiles were our first indication of the complexity and engineering that went into the shuttle. Each one is unique in size, shape, and surface. Each one has its own serial number. The tiles are crucial to successful re-entry. It was the failure of these tiles which led to the loss of Colombia in 2003. 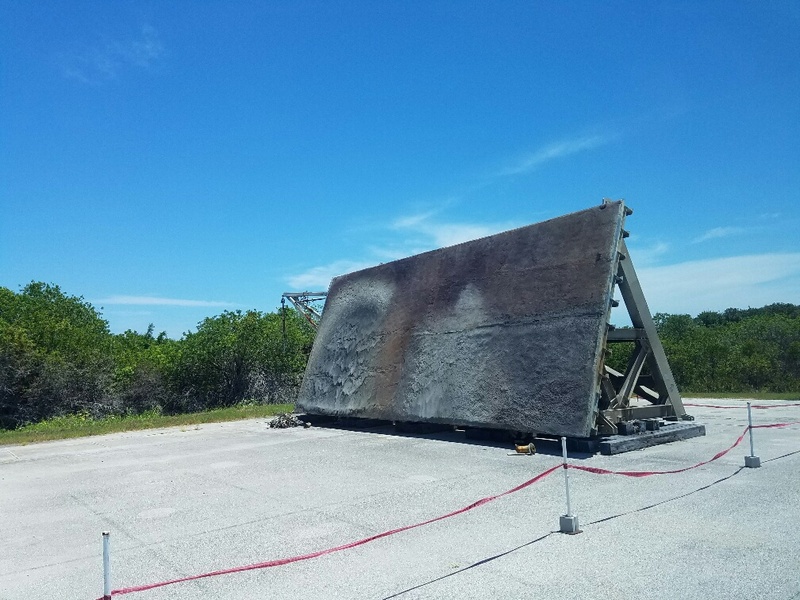 Debris from the external fuel tank hit the tiles on the left wing during launch. The damaged tiles were unable to prevent superheated gas from entering the wing area during re-entry. Like a welding torch, the gasses cut into the wing which damaged the shuttle and caused a catastrophic destabilization at 12,300 miles per hour. The shuttle broke apart. After that, NASA changed the process for the tiles including an inspection prior to re-entry. The Atlantis center has mockups of the interior of the shuttle. I was able to sit in the cockpit, surrounded by control panels. 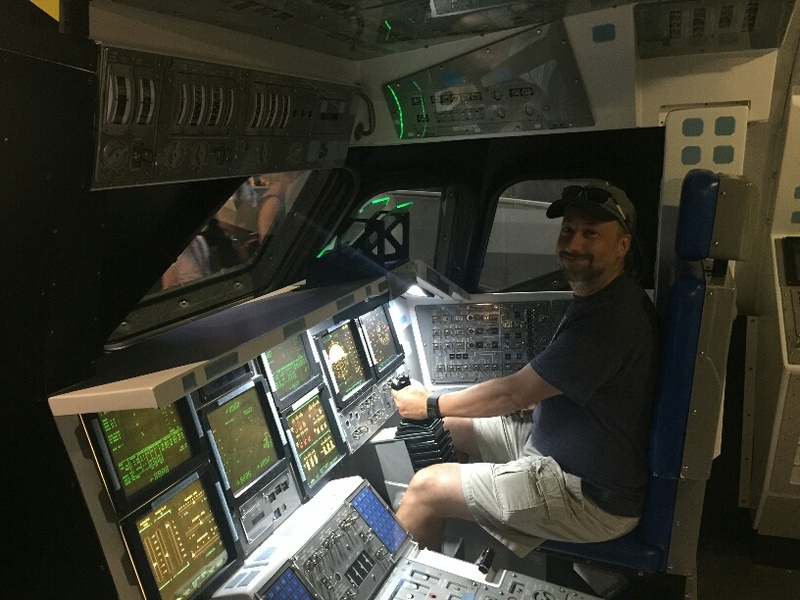 There was also a shuttle simulator where I tried my hand at landing the shuttle. Meaning, I crashed into the runway. I did better on the simulator at Alamogordo. The center has an escape slide setup where we could simulate an evacuation from the cockpit. Oh, who are they kidding. There is no evacuation from the cockpit. Its just something to have fun on. Didn’t matter. We had to do it! 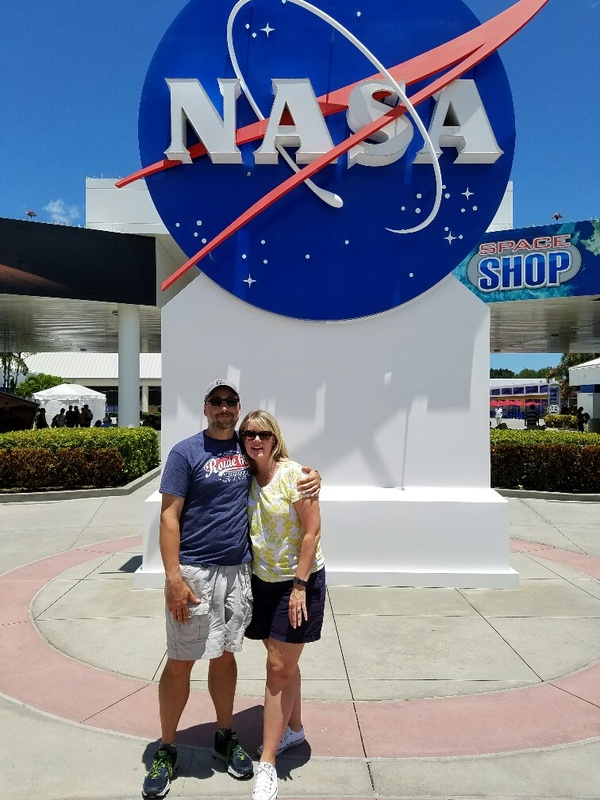 As we left KSC, I couldn’t help thinking that NASA’s best days are behind it. It has been 40 years since we went to the moon. Even the shuttles are history now. Designed in the 1970s, built in the 1980s, and retired 5 years ago. Everything in the rocket garden was from long ago. I would like to think we did it because at heart, Americans are explorers. Which we are. But I think the reality is that Americans are also competitors, and we really wanted to beat the Russians to the moon. As soon as we did that, we backed off and haven’t left near-Earth-orbit since. At least, not with humans on board. We ran out of countries to compete with, and we just backed off. NASA has had some very impressive robot missions, including several to Mars, to Pluto, and most recently to Jupiter. But no people. NASA is saying that they have plans to put humans on Mars in 2035 or 2040, but even those plans area already being described as “tentative.” Space X is far more aggressive, shaving 15-20 years from that timeline. I certainly hope Space X makes good on that, and that NASA even jumps in and helps. I would love to see a human on Mars in my lifetime. Matt Damon was close, but not close enough. Pingback: Portland and a walk down memory lane – Live MoHo!